The mantle of second-largest equity market in Asia was returned to Hong Kong when markets closed on Tuesday, as the Hang Seng's torrid YTD rally brought the total capitalization of Hong Kong-listed stocks to $5.78 trillion, eclipsing that of $5.76 trillion for Japan. Hong Kong-traded stocks have added $937 billion of market value this year, compared with $371 billion for Japan, as the city-state's benchmark Hang Seng Index crossed into bull-market territory last week, as a rally in mainland-traded 'A'-shares has filtered over the border to Hong Kong. According to Bloomberg, expectations that China's economic slowdown will bottom out before the beginning of the second half of 2019 have helped lift its equity market, still the largest in Asia, following last year's stunning drop. Though both Hong Kong and Japanese stocks sunk on Tuesday after the IMF again downgraded expectations for global growth. 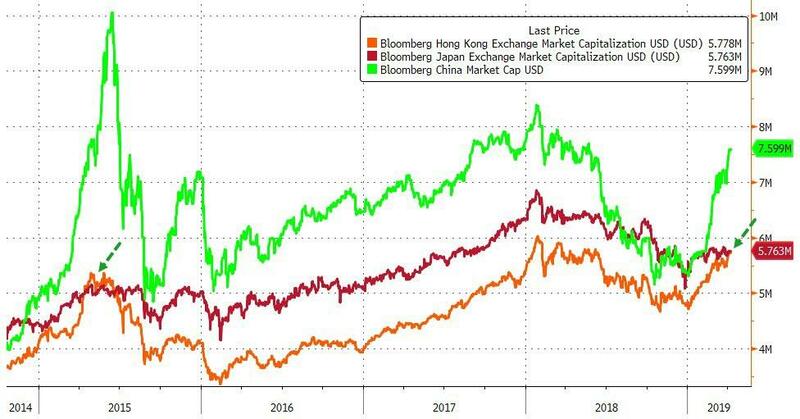 However, the Hang Seng's double-digit advance has been almost entirely driven by one stock: Tencent Holdings, which BBG said is responsible for 14% of the index's 16% gain. AIA Group and Ping An Insurance Group of China were in second and third place, respectively. The last time the value of Hong Kong's publicly traded markets eclipsed that of Japan's was in April 2015. The city only managed to hang on to the edge for two months. China remains by far the biggest equity market in Asia with a market cap of $7.6 trillion, while the US is still the No. 1 in the world, with a market cap of $31.3 trillion. While Hong Kongers can celebrate this milestone for as long as it lasts, somewhere in Tokyo, the BOJ is likely planning another bout of equity buying to push the market higher, now that the market-cap competition has become a point of national pride.